Assessment at ISNS is designed to support student growth and learning. The philosophy and practices of assessment at ISNS are constantly evolving to meet our school’s unique assessment needs as well as reflect the latest research in pedagogy. Our assessment philosophy applies to the whole school and is to be understood and implemented by all teachers, students, parents, and administrators. It is directly linked to our mission statement: "ISNS develops globally responsible and compassionate young people by encouraging them to become active and inquiring life-long learners within an intercultural community." ISNS is implementing the International Baccalaureate (IB) Programmes at its Primary, Middle and High School levels. These programmes, known as PYP, MYP and DP (Diploma Programme) guide the way in which students are assessed. IB is a framework within which schools organize their teaching and learning. The IBO programmes are student focused and inquiry based. There is much to learn about the IBO, however a full explanation is not within the scope of this document. Those interested are encouraged to find the IBO’s online presence as well as attend information sessions provided by the school or contact the school directly. ISNS uses Canadian Curriculum (Province of New Brunswick) within the International Baccalaureate (IB) framework. Reference to our school’s Admissions Policy, Language Policy and Special Educational Needs (SEN) policies are also helpful to acquire a fuller understanding of assessment in context. Pre-assessment: Occurs before embarking on new learning to uncover prior knowledge and experiences. Typically, this form of assessment is undertaken at the beginning of a new unit and acts to inform the teacher in the planning, teaching and learning and assessment cycle. It also identifies the individual needs of learners. Formative Assessment: Provides information that is used in order to plan the next stage in learning. It is interwoven with learning and helps teachers and students to find out what the students already know and can do. Formative assessment and teaching are directly linked and function purposefully together. Formative assessment aims to promote learning by giving regular and frequent feedback, as well as gathering ongoing data (through observations, anecdotal records, checklists, etc.) about student learning. This helps teachers to plan for future teaching, identify where program adjustment is needed and continue to provide learning opportunities, which aim to extend students’ knowledge, understandings and develop skills. Formative assessment also enables learners to improve knowledge and understanding, to foster enthusiasm for learning, to engage in thoughtful reflection, to develop the capacity for self-assessment, and to recognize the criteria for success. Diagnostic Assessment: All assessments can provide diagnostic evidence, which is used to feedback into formative and summative assessment. In both the PYP and MYP, International Baccalaureate (IB) unit plan templates are used to build each unit of work. A backwards design is used in unit planning by identifying the learner outcomes and understandings to be assessed first, and then developing learning experiences that directly support those outcomes and other elements of the programme. The DP courses follow a scheme of work template. A similar backwards design approach with careful consideration of assessment at the beginning of each unit of work is considered good practice and an expectation in all subjects. Student work is assessed according to criteria that are published by the IB Organization (IBO), and modified to suit the grade level or designed for the assessment task. Task specific performance indicators are designed to help students understand the elements and standards of the assessment task, which are what the teachers expect. The assessment criteria and rubrics are given and explained to students before the assessment task. Collaborative planning ensures commonalities of teaching within a grade level and the subject area standards and benchmarks are addressed. Collaborative planning occurs within a grade level and within and across subject areas. Collaborative planning involves discussion of: assessment tasks, alignment of assessment tasks with standards and benchmarks, moderation of marking where appropriate and instructional activities. Specific guidelines for collaborative planning are issued by the IBO. The PYP curriculum’s Program of Inquiry (POI) is developed within themes that are the basis of inquiry during the academic year. Four transdisciplinary themes are explored in K3 and K4 whereas all six transdisciplinary themes are explored from K5 to Grade 5. Students explore these themes within Units of Inquiry (UOI) and in greater depth and complexity as they move through each successive grade. The MYP also uses units of inquiry but with a different focus. (This is explained further on in this document.) PYP students will have four reporting periods throughout the school year: the first and third will be conference-based and focus on progress to date, while the second and last report will be in report card format. Parents will receive information about each unit of inquiry before and during the unit of inquiry. Each unit will include both formative and summative assessment and will be deliberately planned (in the planners) to be fair, consistent and developmentally appropriate. ISNS teachers are cognizant to make sure that all essential elements are assessed: knowledge, concepts, skills, attitudes and action. The purpose and means of assessment should be clearly explained to the children. Each PYP report card will provide marks for each unit of inquiry studied during the term covered by the report as well as marks for subject areas such as Mathematics, English Language Arts, Chinese Language, Music, Visual Arts and Physical Education. Wherever possible, assessments of these subjects may also take place within the Units of Inquiry. 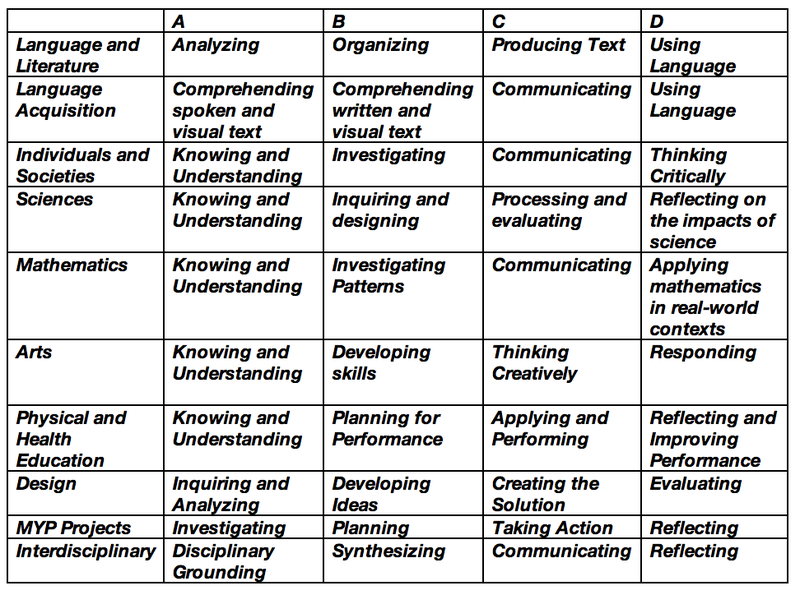 Marks for each Unit of Inquiry will be given for Understanding and Skills (Approaches to Learning). Anecdotal comments will include reference to conceptual understandings, attitudes and actions arising from what students have learned as well as evidence related to the acquisition of the characteristics of the learner profile (explained later). Feedback with regard to work habits will also be provided at every reporting period. Evaluation methods to measure proficiency may be through performance based assessments, student initiated action or through selected response items. Those involved in evaluating student responses, products or performances may include any one or combination of the following; teacher(s), student(s), parents/community members, expert judges. Feedback methods may be in one or any combination of the following: numerical or letter score, developmental proficiency scale, narrative report, checklist, verbal report/conference. 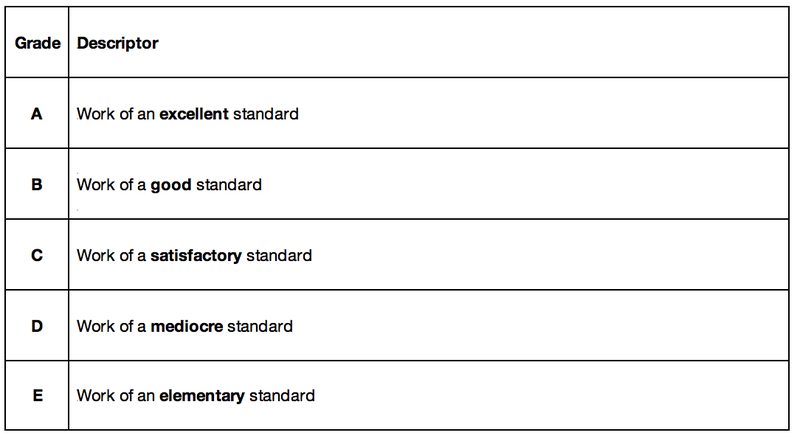 A description of the marking criteria will accompany report cards. A general reflection on the unit of inquiry, including knowledge and understanding gained about the central idea and possible future investigations. Each student will maintain self-reflections taken from each unit to be passed from grade to grade so students/parents will have cumulative student generated assessment from their PYP experience. While at ISNS, all participants in the learning process are expected to model the attributes of the IB Learner Profile which describes learner characteristics that are considered necessary for a learner to become a competent learner and internationally-minded. The assessment of these characteristics will be for students to self-reflect and set goals on their development of the attributes. Student self-reflections of the IBO Learner Profile will be recorded in their portfolios and other student materials. All units of inquiry have identified Learner Profile attributes that are promoted and developed. Students in Grade 5 will reflect on their personal growth and journey through demonstration in the exhibition. This will also be evident in their student portfolio. Assessment of the Learner Profile and attributes will be student-driven. Parents are encouraged to facilitate student goal setting and reflection with regards to modeling the attitudes and attributes of the International Baccalaureate Programmes. Students, parents, teachers and school administration are expected to model the Learner Profile while at ISNS. Students are held accountable to show evidence of modeling and understanding the characteristics of all profile attributes through behavior, writing reflections and unit stipulations. Purpose: The purpose of a student portfolio is to help students reflect on their learning, to show growth over time and to show development of the whole child both inside and outside of the Programme of Inquiry in all subject areas. The portfolio allows all those involved in the learning process to see a true picture of the child. It may also serve to help the teacher reflect, assess and guide teaching and learning practices. Every unit of inquiry will include one student-generated reflection in response to a piece of work. Self-reflection will include at least one attribute of the Learner Profile. (K3 and K4 students will choose two pieces of work to include in their portfolio). For each academic year, two samples of work will be included from each of the specialty subjects: Mandarin Language, Visual Arts, Music, and Physical Education (PE). Grade 3 to 5 students will be using digital portfolios. K3 to Grade 2 students will use a 1 1⁄2 “ binder separated by tabs into grade levels. Follows the student from K3 – Grade 5, passed from teacher to teacher before new school year and given the student at end of Grade 5. The student is responsible for maintaining the portfolio, with teacher guidance. Students should be able to explain why specific materials are in their portfolios. Philosophy: The primary function of reporting student progress is to establish, encourage and maintain communication between the home and school, the child and parent/ guardian, and the learner and teacher. The type of Fall conference will be of the type described below while the Spring conference will be student-led. Special accommodations may be needed to suit individual family needs. Parent-Teacher conference is an opportunity to establish a relationship with a parent(s). One goal is for the teacher to learn about the student from the parent to guide instruction. Another goal is for the teacher to share evidence of student learning growth (compared to themselves and grade level expectations or standards) with the parents. Goals and concerns for the year to come are developed and addressed. To have students reflect on their own growth and take ownership for their own learning. To set goals with the student and parent to insure the student’s continued success. Student feedback is critical for differentiation and individual growth. On-going informal conferencing can guide instruction. To help students with self-reflection by modeling and discussion. Students will receive four reports throughout the school year. The first report card will report student progress against the IBO’s ‘Approaches to Learning’ (ATLs) and the Learner Profiles. The ATLs and Learner Profiles are assessed through student-led activities to gauge their overall understanding, which is then used to report on their skill levels, (Novice, Learner/Developing, Practitioner/Using, Expert/Sharing) with in ATLs and their best attributes or improvement areas. Teachers and students comment on their intentions to improve in both areas on the first report. The second and third reports will identify student progress against the subject specific criteria and the ATLs and the fourth report card will report final achievements in each of the MYP subject groups, with a final report of the ATLs. In the progress and final reports, students are assigned numerical grades based upon their progress towards meeting criterion objectives set out by the IBO. All subject teachers will also provide anecdotal comments of student behavior and progress within their subject. 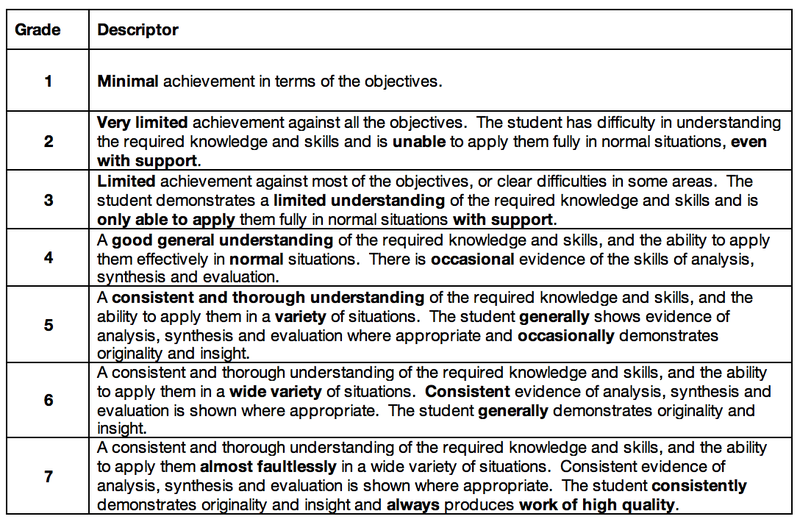 There is a set of objectives for each subject to match the assessment criteria. Every subject has four criteria. (See Figure 1). Subjects may have different numerical bands (MYP Subject-specific guides). Grading is based on the level of achievements for each criterion (See Figure 2). The final achievement level for all the different criteria is based on the year’s summative assessments and the teacher’s professional judgments. The so-called “Best-fit approach” allows the teacher to select the achievement level that best describes the student’s work in all. A mark for the MYP Personal Project will be included on the report cards for all Year 5 (Grade 10) students. All students are assessed against four Assessment Criteria described in each MYP Subject Guide. Each criterion is considered equal, and is further divided into bands. Each band contains a set of statements outlining their qualitative values. Each criterion strand must be evaluated twice within the academic year for each grade level and subject group. There are two reporting periods (semesters) in the year. Interim achievement grades will be reported halfway through each semester, based on assessment tasks done up to that point, and a final report will be issued at the end of each semester. Each of the two reporting periods (semesters) is independent - the achievement grades at the end of that semester are based on assessment tasks during that semester only. Grades do not “carry over” into the next semester. The semester system is used because many universities, particularly those in North America, require transcripts from Grades 9-12, with two achievement grades from each year. In all reports, students are assigned grades based upon their progress towards meeting academic learning objectives and benchmarks. All subject teachers will also provide anecdotal comments of student behavior and progress within their subject. For students completing the full Diploma Programme, anecdotal comments will also be made regarding progress in the Theory of Knowledge class, CAS and Extended Essay components. Students at ISNS can choose to be full DP students, DP certificate candidate students, or New Brunswick stream candidates. All students, regardless of stream, will attend the same classes and complete the same ISNS internal assessments and exams. Full DP students and DP certificate candidates will also be required to complete the official IB assessments as outlined in the respective subject guides. All IBO DP courses require both Internal (IA) and External Assessment (EA). Internal Assessments are assessed by ISNS staff following IBO issued guidelines and are moderated by the IBO. External assessments are developed by the IBO and assessed externally. The combination of these two assessments will result in an IBO grade of 1 to 7, issued by the IBO in July of the graduating year. ISNS will not report these official IBO grades on report cards or transcripts, with the exception of an ‘Official Predicted Grades’ form created in April of the graduating year for the purpose of university application. All DP subject teachers will assign internal grades based upon student progress towards meeting academic learning objectives and benchmarks. The IBO’s Internal Assessment work may also be included in this mark. New Brunswick, Canada academic credits (2 for each year of a DP course) will be issued upon the successful completion of each course on the final report card of the academic year. Many assessment tasks in the DP use assessment rubrics, just as in the MYP. 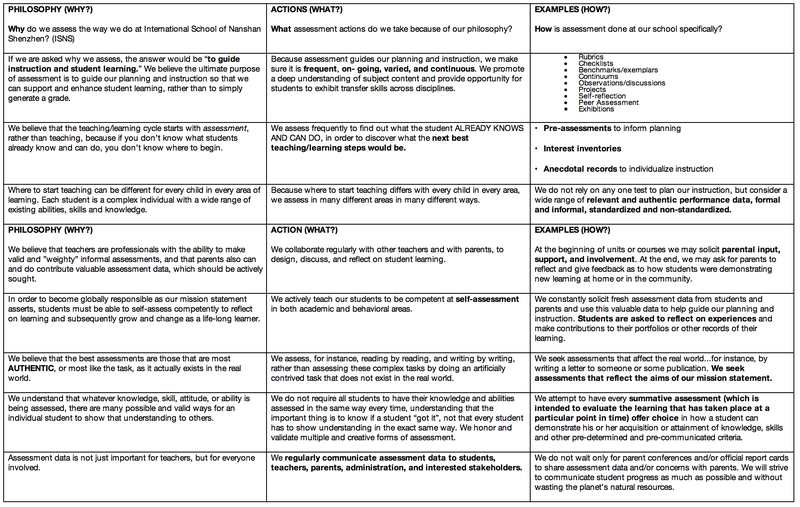 These rubrics contain descriptors used to assess a student’s performance in a task. The descriptors are hierarchical and are associated with a numerical grade. Examinations in the DP generally use standardized marking schemes to arrive at a numerical grade. Assessments in the DP are rigorous and demanding. Each student at the International School of Nanshan Shenzhen is expected to submit assignment work on or before the due date (or the negotiated deadline if an extension of time has been given). The vast majority of ISNS students work hard to meet assignment deadlines. In the event that a student is unable to complete the assessment on time, a extension may be granted under certain circumstances. Refer to the ISNS Late Submission Policy for more details on how ISNS grants extensions in the DP. In the core areas of Theory of Knowledge (ToK) and the Extended Essay (EE), an A-E scale is used. Descriptors for this scale are given below. Each IB DP subject has a variety of assessment components. Each component is marked using an IB rubric or mark-scheme and assigned a numerical mark. Grade boundaries are then applied to arrive at an overall grade on the 1-7 scale for that component (A-E for ToK and EE). Grade boundaries for all subjects are published annually by the IB in subject reports. In some subjects, the grade boundaries remain consistent over time, while in other subjects the grade boundaries change year to year. ISNS uses representative grade boundaries to give an accurate judgement of student achievement during a semester. These grade boundaries may change from year to year. To arrive at an overall achievement grade for a subject, the numerical marks for each component that has been assessed are combined together using appropriate weightings to give a total value. 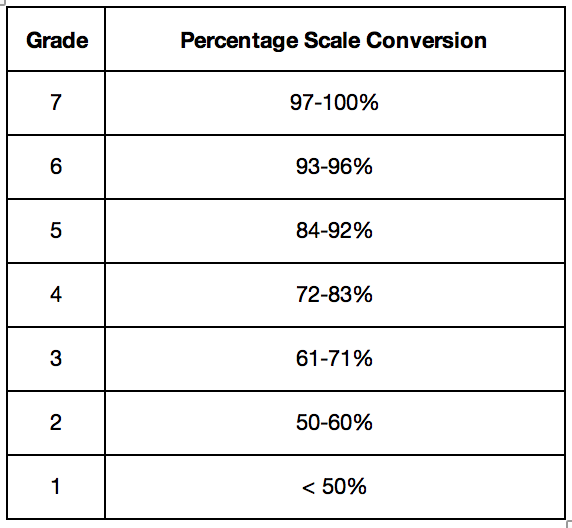 Overall grade boundaries are applied to give an overall achievement grade on the 1-7 scale (A-E for ToK and EE). Not all components are assessed in all subjects in all semesters of the course. Teachers will be asked for predicted grades for each subject, to support Higher Education applications and to send to the IB just before students sit final exams. Predicted grades are the professional judgement of the teacher, at that moment in time, of how the student will perform in the final formal assessment. While they are informed by achievement grades in reports and by trial exam grades, they may or may not be the same as achievement grades in reports or trial exam grades. Predicted grades are not formally reported to parents, although they will be shared verbally with students as appropriate. The integrity of the process requires that students and parents are not allowed to influence teachers to give higher predicted grades. Data obtained from these assessments provide information about individual student achievement and provides a perspective on trends in schools, district, and provincial achievement in literacy. Many of our students may be involved in our EAL program based on their language proficiency level using standardized assessments. Although these EAL students are assessed based on the grade appropriate curriculum standards at their grade level, attention is paid to the progress that students are making regarding their language acquisition and their efforts in meeting these grade level standards. EAL students in the PYP and MYP, will receive progress reports twice a year. Students are assessed using a standardized test to determine if they can advance to the next EAL level when both the EAL and homeroom teacher sees progress in their language growth. This test examines their ability in all four main skill areas of language, which are reading, writing, listening and speaking. Once students are proficient in English, which is determined by assessments and in class work, they are exited from the EAL program. All children are observed often and regularly, with the teacher taking a focus varying from wide angle focusing on the whole class to close-up focusing on one child or activity, and from non-participant observing from without to participant observing from within. These are collections of students’ work that are designed to demonstrate successes, growth, higher order thinking, creativity and reflection. Portfolios include examples of self, peer and teacher reflections. These are situations in which children are presented with a stimulus and asked to communicate an original response. The answer might be a brief written answer, a drawing, a diagram or a solution. These are single occasion, one-dimensional exercises such as tests, quizzes and examinations. The students’ skills are observed regularly and the observations are recorded. These are assessments of goal-directed tasks with established criteria that are authentic challenges and problems. There are numerous approaches to the challenges/problems that require the use of many skills and there is rarely only one correct response. Audio, video and narrative records are often useful for this kind of assessment. Taken together, the assessment strategies form the basis of a comprehensive approach to assessment. Whatever strategy is used, self and peer as well as teacher (and sometimes parent) reflections are seen as an important stage in the learning process. Peer reflections include reflections completed by students at different grade levels, and teacher reflections include those completed by teachers other than the homeroom or subject teacher. An established set of criteria for rating students in all areas. The descriptors tell the assessor what characteristics or signs to look for in students’ work and then how to rate that work on a predetermined scale. Rubrics can be developed by students as well as by teachers. Samples of students’ work that serve as concrete standards against which other samples are judged. 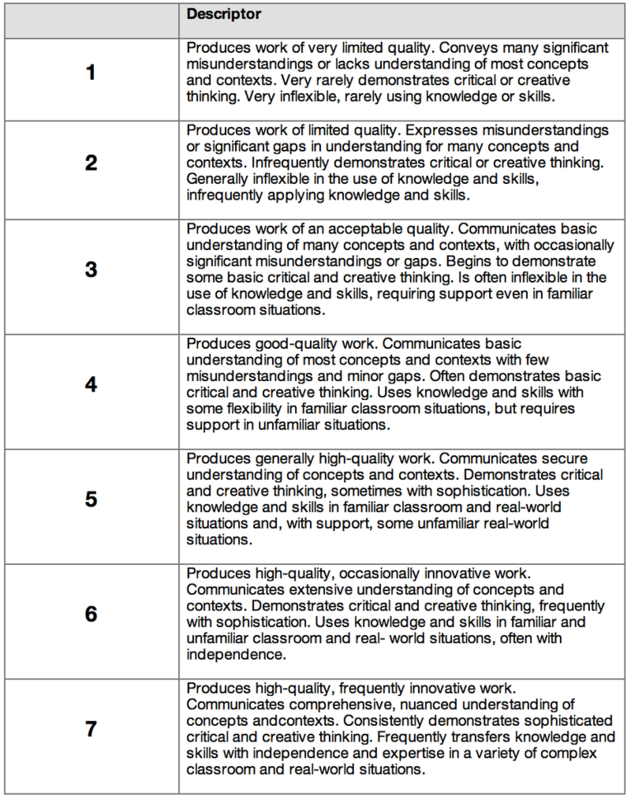 Generally there is one benchmark for each achievement level in a scoring rubric. Each school is encouraged to set benchmarks that are appropriate and usable within their particular school context. These are lists of information, data, attributes or elements that should be present. Anecdotal records are brief written notes based on observations of students. “Learning stories” are focused, extended observations that can be analyzed later. These records need to be systematically compiled and organized. These are visual representations of developmental stages of learning. They show a progression of achievement or identify where a student is in a process. The purpose of conferences is to share information between teachers, students and parents. A school should determine the function of conferences in order to develop their structure, and this might include goal setting. These conferences may take a formal or informal structure. These are designed to give teachers the opportunity to discuss a student’s progress, challenges, etc… and effective strategies to assist student learning and development. These are designed to give the parents information about the student’s progress development and needs, and about the school’s program. Teachers should take this opportunity to gather background information, to answer the parents’ questions, to address their concerns, and to help define their role in the learning process. The parents should take the opportunity to provide the teacher with the cultural context of the student’s learning. The conference will involve the students discussing and reflecting upon samples of work that they have previously chosen to share with their parents. These samples have been previously selected with guidance and support from the teacher, and could be from the student’s portfolio. The student identifies strengths and areas for improvement. It enables parents to gain a clear insight into the kind of work their child is doing and offers an opportunity for them to discuss it with their child. The conferences must be carefully prepared, and time must be set-aside for the students to practice their presentations. The format of this conference will depend on the age of the student and all of the participants must understand the format and their roles prior to the conference. IBO (2007) Making the PYP happen, Geneva. This policy will be reviewed bi-annually (before second and fourth reporting periods) by the pedagogical leadership team of the school and any proposed changes which might reflect new research, source documents or ways to improve the policy’s effectiveness will be shared with the school community for their input (teachers, parents, students if appropriate and director/board) before any changes are made. Any changes will be communicated to the learning community and members of the pedagogical leadership team will share responsibility to make sure the changes are implemented.